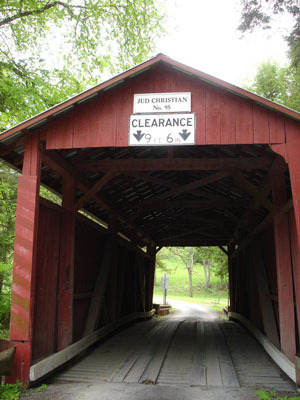 The Jud Christian Bridge spans Little Fishing Creek between Jackson and Pine Townships, located on Ardens Hill Road, off of Sereno Hollow Road, north of Millville and Iola. 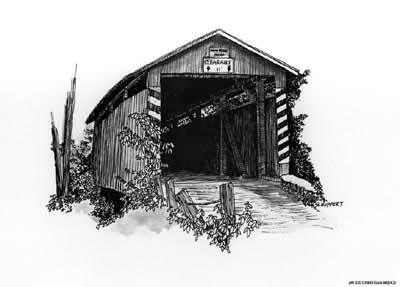 Built in 1876 by William L. Manning for $239.00, the bridge was named after a nearby farmer and lumberman. The Jud Christian bridge is in near-perfect condition: The stone and mortar abutments are solid; the wood ribbing of the roof is uniform; the wooden pegs (trunnels) are still in evidence; and the wall covering is in excellent condition.